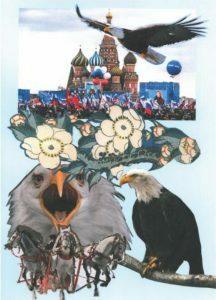 Ron Ridenour’s latest book (this is his 10th book on international relations and politics) takes a direct shot at one of the most prevailing myths in the western political discourse: the thesis that Russia, then the Soviet Union, and, since 1991, Russia again have been uniquely aggressive and generally bellicose states. At a time when rabid russophobia is the order of the day (again – chronic russophobia has been a regular feature of western political culture for many centuries now), this is a very timely and important book which I highly recommend to those interested in history. The first and the third parts of the book are extremely well researched and offer a rock-solid, fact-based, and logical analysis of the Cuban Missile Crisis and its modern equivalent, the AngloZionist “crusade” against modern Russia. This is a very important and good choice because the two crises have a lot in common. I would even argue that the current crisis is much more dangerous than the Cuban Missile Crisis because of the extremely low personal and intellectual qualities of the current US ruling elites. Ridenour shows that in 1962 it was not the Soviets, but the US which pushed the world to the edge of a nuclear war, and in the third section of his book he shows how, yet again, the Empire is cornering Russia into a situation which, again, very much risks resulting in a nuclear conflict. There have been courageous voices in the West trying to stop this crazy slide towards a nuclear apocalypse (I especially think of Professor Stephen Cohen and Paul Craig Roberts) but their’s were truly “cries in the wilderness”. And it doesn’t matter one bit whether somebody identifies himself as a conservative, liberal, progressive, libertarian, socialist, anarcho-capitalist or by another other (mostly meaningless) political label. What matters is as simple as it is crucial: preventing the Neocons from triggering a war with Russia or with China, or with Iran, or with the DPRK, or with Venezuela, or with… (fill in the blank). The list of countries the US is in conflict with is very long (just remember Nikki Haley berating and threatening the entire UN General Assembly because the vast majority of its members dared to disagree with the US position on Jerusalem), but Russia is (yet again) the designated arch-villian, the Evil Empire, Mordor – you name it! Russia is the country which wants to murder everybody with poison gas, from the Skripals in the UK, to the innocent children of Syria. Russia is the country which shoots down airliners and prepares to invade all her western neighbors. Finally, Russia is the place which hacks every computer in the “Free World” and interferes with every single election. The longer that list of idiotic accusations stretches, the bigger the risk of war becomes, because words have their weight and you cannot have normal, civilized relations with the Evil Empire of Mordor which is “highly likely” to invade, nuke or otherwise subvert the peace-loving peoples of the West.